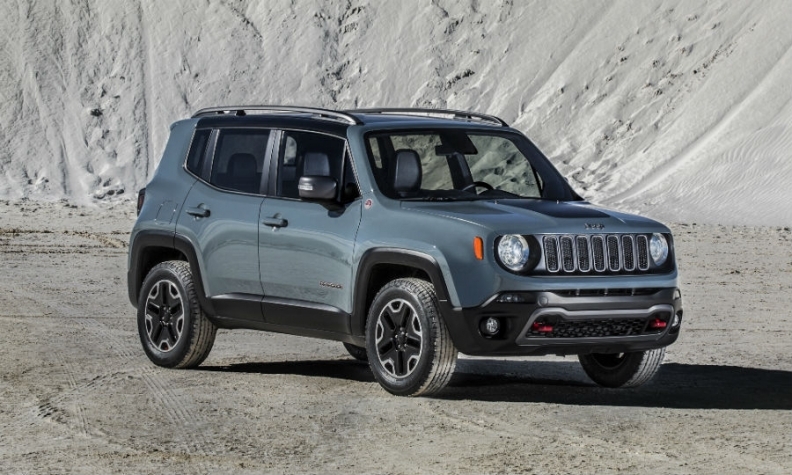 The Renegade has Jeep's prominent grille and boxy styling. GENEVA -- Jeep tomorrow will unveil its new Renegade subcompact SUV. The name and pictures of the SUV were leaked on Sunday by a U.S.-based Web site ahead of Jeep's Tuesday embargo. Multiple media outlets have posted photos and details about the model today. The Renegade is key to parent Fiat Chrysler Automobiles' ambitious global growth plans for the iconic off-road brand. It has the traditional boxy Jeep look with a prominent grille and trapezoidal wheel openings. The Renegade is "designed in America and built in Italy," Jeep said in a statement. Built on Fiat's "small wide" platform, the "baby Jeep" will be sold only with four-wheel drive, including a Trailhawk Trail Rated version, and will offer both gasoline and diesel engines. The Renegade interior is "robust and lively," the company said, "in keeping with Jeep heritage," and comes equipped with voice-activated 5-inch or 6.5-inch touchscreen. It will be the first small SUV to offer a nine-speed automatic transmission, Jeep said. An open air version will also be offered. The company did not reveal price or any technical specifications other than to say that its diesel MultiJet II and gasoline MultiAir engines will be made in Italy, the United States and Brazil. The Renegade is key to Jeep's target of selling 1 million vehicles worldwide this year, up 37 percent from a record 731,565 last year. The model arrives at a time when Europeans are snapping up smaller SUVs despite weak car sales and many U.S. customers are looking to downsize into smaller SUVs. The Renegade will be built at Fiat's plant in Melfi, central Italy, alongside Fiat brand's sibling model, the 500X. The Jeep version will go on sale in Europe in the summer and in the United States late this year, while the 500X will be unveiled at the Paris show in October and appear in European dealerships by year end, and in spring 2015 in the United States. The company has not released sales targets, but supplier sources have told Automotive News Europe that Fiat and Jeep plan annual production of up to 280,000 units of the two models. Jeep's volume will be about 150,000, while Fiat's version will account for 130,000 units. In Europe, the Renegade and the 500X will compete against small crossovers such as the Nissan Juke, the segment's leader, Opel/Vauxhall Mokka, Peugeot 2008 and Renault Captur. The Renegade comes to market just as European car sales are starting to recover from their six-year slump and amid a dearth of product for Fiat, Jeep's owner. Automotive consultancy IHS forecasts subcompact SUV sales of 640,000 units in western Europe this year, up from 550,000 in 2013 and 345,000 units in 2012. The Renegade is the second Jeep to be built on a Fiat platform after the new Cherokee mid-sized SUV launched last year.